Equity: The Driver for School Improvement? What will drive school improvement in the future? Some believe that it will be choice—ensuring that students have choice in what and how they learn; allowing teachers to have greater autonomy in the classroom; and, possibly, providing families expanded choice of schools. For others the key driver may be ensuring equity. Proponents argue that the biggest barrier to effective education is equity of resources and opportunities. Pasi Sahlberg, currently a visiting professor at Harvard University and the former director general for the Centre for International Mobility and Cooperation (CIMO) in Helsinki, has made the case that Finland's meteoric rise has been as a result of a focus on equity, and that this has been consistent across the Organisation for Economic Co-operation and Development's Programme for International Student Assessment (PISA) high performers (Korea, Canada, and Japan). What are we currently doing in our schools that will affect—negatively or positively—the future? The ASCD Whole Child Symposium addressed what the "schools of the future" will look like and how the decisions we make today will shape what and how students learn tomorrow. Over the course of three events, we asked thought leaders, authors, practitioners, and students what they think currently works in education, what we need in the future to be successful, and how this can be accomplished. Teachers Are Not a Problem. They Are an Opportunity. Written by Andy Hargreaves, the Thomas More Brennan Chair in the Lynch School of Education at Boston College. This article originally appeared on Education Week's Finding Common Ground blog. Woody Allen quipped that when we face a crossroads in life that leads to utter hopelessness or total extinction, we should choose wisely between them. Yogi Berra said that if we come to a fork in the road, we should take it. When Eric Clapton went down to the crossroads, he just fell down on his knees. In 2014, the future of teaching is at a gigantic global crossroads, but the choices need not be as oddball as the ones that the ABC's of Allen, Berra and Clapton offer us! Last week, the Unite for Quality Education movement, organized by the global teachers' union organization, Education International, met in Montreal to advance its campaign of providing universal and free access to quality teachers to all students. This is a bold goal—not just access to education, good or bad, in huge classes or less, with properly qualified teachers or not; but access to quality education and quality teachers for everyone. The decisions we make today—for our systems, our schools, and our classrooms—will affect what all of our tomorrows will look like. This spring, ASCD hosted its inaugural Whole Child Symposium, a series of in-person and online events in which experts, policymakers, teachers, and students discussed education policies, processes, and practices and their influence on children, societies, and economies in the future. Imagine in your mind, a map of your community. Nothing detailed; just the boundaries and general lay of the land. Got it? Now add in the major areas in your community where people live and work and play. You know, to give yourself some bearings with a few landmarks. Still with me? Good! Now convert this mental image into a heat map. You know, where the hot spots flare up in bright yellows, oranges and reds? Picture in your mind hot spots that indicate places people go to learn new things and practice skills that are important to them. Where are those heat surges? Athletic fields? Dance studios? Book stores? Parks and beaches? Art galleries? Theaters? How about school buildings? No? Why aren’t school building hot spots on anyone's heat map? Because tests don't require connection and collaboration, classroom education is being driven in one direction, while technology enables creation, curation, and connection. Educators are up against a global achievement gap, Tony Wagner explained in his 2014 ASCD Annual Conference session, "Graduating All Students 'Innovation Ready.'" That is, the gap between the skills students need and the skills that are driven by the testing culture dominating U.S. education. Building on the conversation started at the earlier Whole Child Symposium Town Hall and Live events, last week's Virtual panel discussions went even further to identify what currently works in education, what we need in the future to be successful, and how this can be accomplished. Watch the archived sessions below and let us know how we can improve the symposium experience. What if I told you the answer to all that ails public education is choice? Not dollars. Not standardization. Not test scores. Choice. Surprisingly effective in its simplicity. Education is a public enterprise funded by taxpayers. Government reports to taxpayers on its performance. Elected officials craft policy and practice in the name of accountability. To thrive in today's global society, children need personalized support, safe environments, good health, and challenging learning opportunities. Adequately preparing students for their future requires a more comprehensive approach to education that recognizes the crucial in-school factors and out-of-school influences that affect teaching and learning. Such an approach requires the collaboration and shared responsibility of families, schools, communities, and policymakers. To support conversation, collaboration, and change, ASCD has released Whole Child Snapshots highlighting how well each U.S. state—and the nation—is meeting the comprehensive needs of its children. The snapshots feature data aligned with the five tenets of ASCD's Whole Child Initiative—healthy, safe, engaged, supported, and challenged. Together, the data provide a fuller picture of child well-being that extends beyond standardized test scores. The snapshots also suggest initial ideas for how communities can make targeted and innovative improvements to support the whole child and help their students become college, career, and citizenship ready. 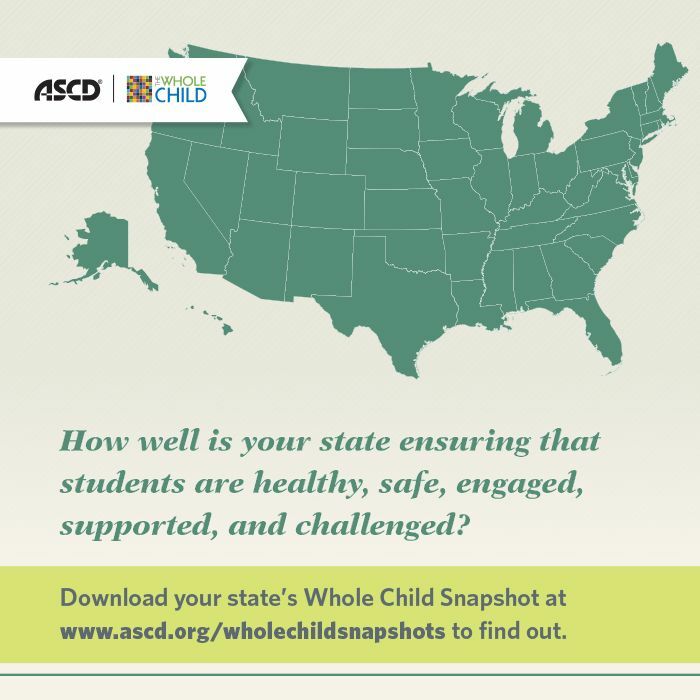 To see each indicator and the full Whole Child Snapshot for each state, visit www.ascd.org/wholechildsnapshots. ASCD's inaugural Whole Child Symposium concludes this week with a series of virtual panels featuring school leaders, policy experts, teachers, and students. You can register, participate live, and join in the discussions on social media. Each panel will discuss what currently works in education, what we will need in the future to be successful, and how this can be accomplished.